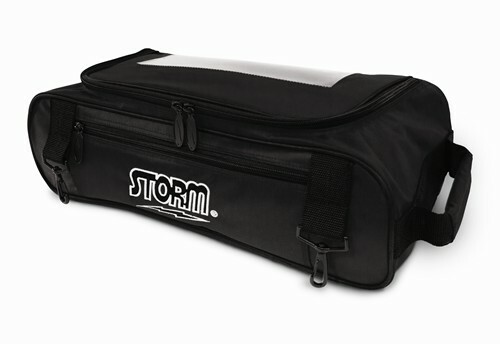 The Storm Shoe Bag is just that, a bag for your bowling shoes. This bag provides a safe place for your shoes that you can carry by itself or attach it to the Storm 3 Ball Tournament Roller/Tote. The Storm Shoe bag can hold up to size 15 shoes and has clear window pocket for personalization. Are there any other pictures? I would like to see how this attaches to the 3 ball tournament bag. Great question Kyle! Unfortunately I can not upload a picture on here for you. The shoe bag will have clips so it can be attached to the 3 ball tournament bag and will rest on the clear "easy view" top. Hi! Yes, you can attach this to any bag that you would like. Is there any space for accessories? This will be just a bag for shoes. Due to the time it takes to produce the Storm Shoe Bag Black ball it will ship in immediately. We cannot ship this ball outside the United States.